What is mutton you might ask? Mutton is a mature sheep; in a sheep's first year of life, it is called a lamb. Yes, mutton and lamb belong to the animal. People in North America prepare far less mutton recipes than Africa, Asia or Europe therefore the term Mutton may seem a little strange. Learn how to make this simply delicious Slow Cooker African Mutton Stew recipe loaded with vegetables and slow cooked flavor. 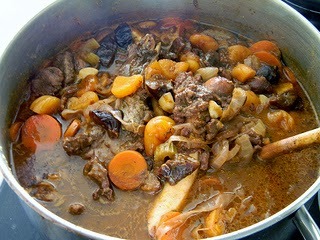 Place lamb or mutton and vegetables in slow cooker. Mix salt, garlic, thyme, and bay leaf into water and pour over lamb and vegetables. Cover and cook on low 8 to 9 hours, until lamb is tender. Serve with rice.